Tracy´s beads and Caroline´s birds are adorable, and you have created beautiful jewellery of them. 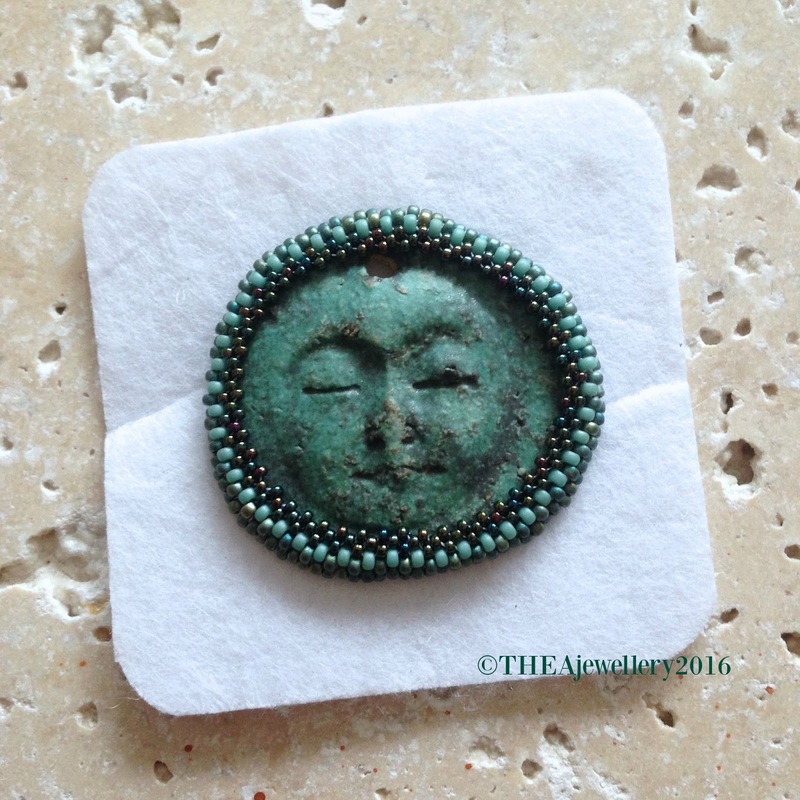 And it´s nice to see what you create from the beautiful beaded piece. I love Tracie's beads and that bracelet is gorgeous, perfect for every day! Love the earrings and embroidery too, I'll look forward to seeing the finished piece. I love the soft colors and the designs. Well done! 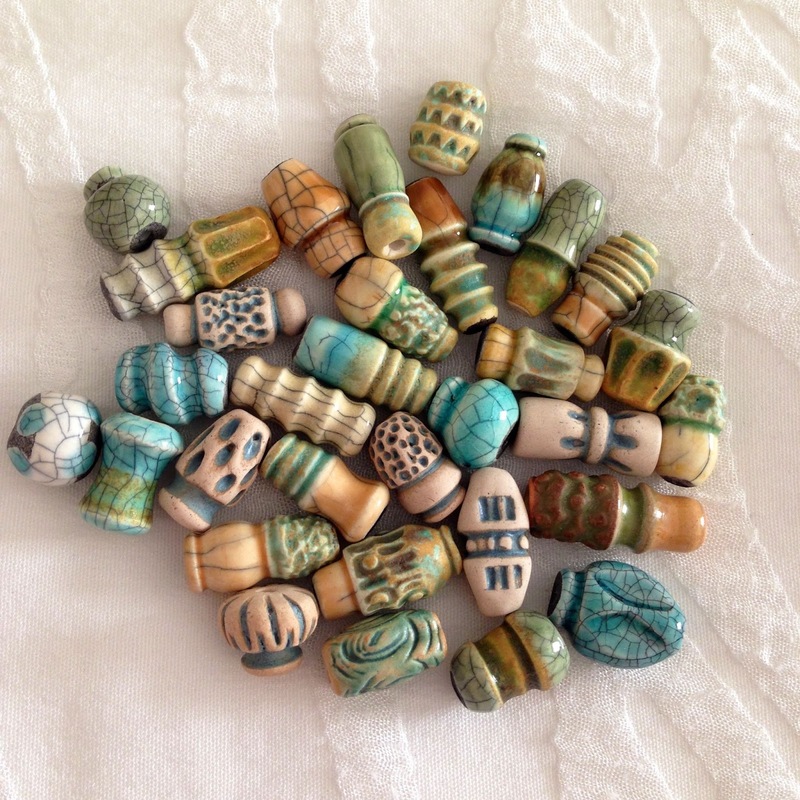 Tracie's beads are awesome and that bracelet is a wonderful design for them. Definitely a wear-everyday piece. I love how you paired Caroline's fat little birds with Jen's speckled eggs. I can see those as a go-to pair of earrings, especially if you wear a lot of blues. And I look forward to seeing the finished bead embroidery piece. The finish on that focal is fabulous. There is serenity in all these colors and designs, they are all so beautiful and soothing! 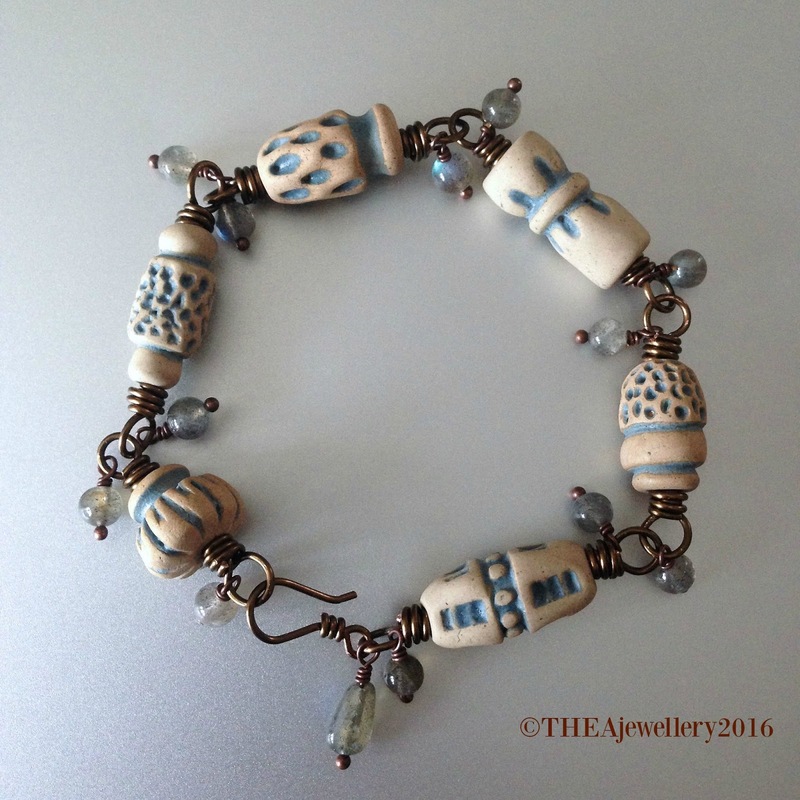 Lesley, what wonderful pieces I love how you have used those beads with the labradorite, the colour play of the stone goes so beautifully with the glaze on the bead and your wire work is immaculate! I look forward to seeing what you do with your seed beaded piece (I already love it)! All your creations are so soothing and make me think of a gentle change from winter to warm spring weather to come. I am particularly taken by the bracelet. Love it! I am totally in love with that bracelet! I tend to play with my jewelry and that those beads are crying out to be fondled. Those earrings are so sweet and remind me of the coming spring. I just love your design sensibility. These are all really pretty pieces and I can't wait to see what happens with that cab. Lovely work! Beautiful pieces and I really like the color palate! 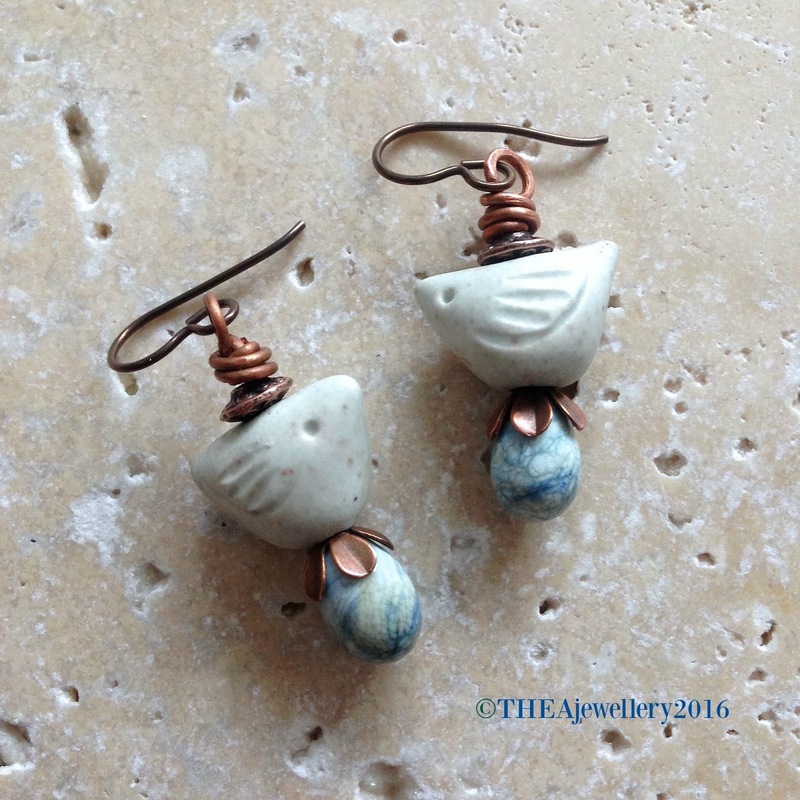 Those birdie earrings are so stinkin' cute! Wow, how stunning is that bracelet! I love it! And the pendant you are working on, can't wait to see it finished. I love the colors in it. I know what you mean about motivation hiding — I'm just coming out of school holidays here and I desperately need to find mine (maybe still at the beach!). Anyway, gorgeous pieces! Enjoy your "worry beads". OMG… I LOVE those earrings! I would wear the heck out of those babies. I know you will enjoy wearing your new bracelet… the dangles really add a special touch. Lovin the share!!! Everything is so pretty! I love what you made with some of your stash. The bracelet is so pretty!